Excerpt from U.S. Coast Guard Proceedings of the Marine Safety & Security Council magazine by Ms. Krista Reddington, special correspondent to Proceedings. In Nikiski, Alaska, in the early morning of February 2, 2006, the tank vessel Seabulk Pride (pictured below) broke free of its mooring lines due to the current and ice in the arctic Cook Inlet. The cargo transfer hoses separated as the vessel drifted from the pier, discharging oil onto the dock. Though ice and current were clearly causal factors leading to the breakaway, the investigation determined that human error was primarily responsible for the casualty. The events leading to the incident began in a very routine manner. By 5:15 a.m., ice had begun flowing near the vessel. Video footage showed a significant amount of ice moving past the dock, and medium-sized ice pans were evident. Prior to the breakaway, strain gauges indicated that the strain in the mooring lines had increased within a six-second period to an approximated tension of 50 to 100 tons. Before the line parted, the A/B (able-bodied seaman) on deck was tending the lines. At 5:23 a.m., two A/Bs were on watch when the after spring wire parted, followed shortly by the other spring wire. The pilot ordered anchors dropped. Because the starboard anchor was frozen in place, only the port anchor could be released, and the current kept the bow pointed toward the shoreline. Multiple mooring lines fouled the propeller, leaving the main engine unavailable, so the master was limited to using rudder and anchors to maneuver the vessel away from shore. The vessel remained at the mercy of the current and grounded just over half a nautical mile north northwest of the dock. Fortunately, the double hull functioned as it was designed. 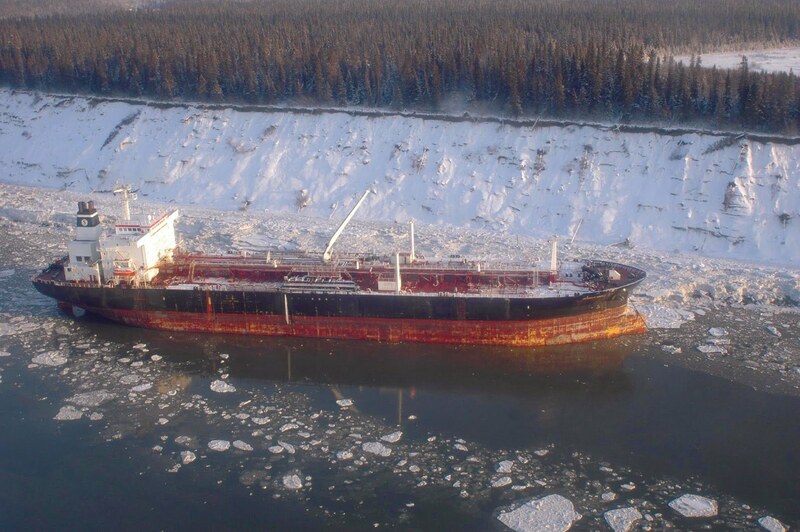 Though the outer hull was penetrated by rocks, no oil contained within the tanks was spilled into Cook Inlet. In Part II, we will describe the Coast Guard analysis and follow-up.